Steve Cradock formed Ocean Colour Scene with fellow band members Simon Fowler, Oscar Harrison and Damon Minchella 21 years ago. After releasing 'Moseley Shoals' and 'Marchin Already' they were set in stone in the British Music scene, selling millions of records world wide. 13 Albums later, they are still going as strong as ever. Steve has a reputation of being one of the hardest working musicians in the industry, obviously 24 years with OCS takes priority, but since 1992 he's been a member of Paul Wellers band too. Steve has played, written and contributed to many of Paul's albums, such as Wild Wood, Stanley Road, Heavy Soul, Heliocentric, Illumination, Studio 150, As Is Now, 22 Dreams, Wake up The Nation and his latest work Sonik Kicks. As well as extensive touring across the world through the years. Cradock’s side projects have included 2 solo Albums, 'Kundalini Target' and 'Peace City West' which he has also taken on the road with the Steve Cradock Band since 2008, supporting the likes of Amy McDonald, Beady Eye and Miles Kane. Many great musicians have joined him on stage during these gigs including Mani from the Stone Roses, Andy Crofts from the Moons/Weller Band, and James Buckley from the Inbetweeners and of course Paul Weller. 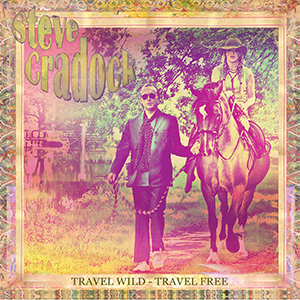 'Travel Wild -Travel Free' - His 3rd solo album is due for release in September 2013 on Proper Records, it was produced by Steve and wife Sally and recorded at Steve’s Studio in Devon as well as Deep Litter Studios. The Record was Mixed and Mastered at Black Barn (Wellers Studio) in Ripley, Surrey by Jan-Stan -Kybert.